The week prior to the last Coconut Teaszers Show (The Revolution meets the Underground) was a difficult one. I was looking forward for the weekend to relax and unwind. I needed an escape and the only escape I had was the underground. This night was different from the other events I been to. This night we were blessed with two-lady poetess that went by the name of Mujeres de Maize (Mujeres de Maiz is an open collective of mujeres of color). When they went on stage I took a couple of photos for the website. Then I closed my eyes to concentrate on their words rather than their appearance. They spoke with such eloquence I was mesmerized by their verbal barrage of words. Every word had meaning and every syllable had emotion. The poetess La Gata recited one poem about how we go to be Mexico to lose our souls in sin and ignore the poor women and children begging for change. Her words painted a picture in my mind. That picture I had captured when I last visited Tijuana a couple of months prior. I remembered how I felt when I released the shutter button. I had only shared that photo with the people closes to me. She inspired me to share my photos the way she shared her words with us. That night I didn�t get a chance to thank her. With the help of my friend Fernando Escobar of 5th Battalion I was able to thank her. She in returned sent a poem to share with you titled �Un Poemia Para Las 11:03 de la Noche�. There was more to this event than dope poetry. This night we were also blessed with some of the best revolutionary groups that are the voice to our streets. MSDC from the Northeast area of Los Angeles started the night with some conscience lyrics for our spirit. Followed by Sekou Tha Misfit who blended asphalt poetry with concrete hip-hop. The crowd was then blown away by own Quinto Sol�s musical fusion of hip-hop-cumbia-reggae-salsa-soul. They are Chicano version of The Wailers, using their music to spread their message. With Quinto Sol�s lead singer Limon being our Mexican Marley of the barrio. After a short intermission to catch our breath and socialized with our peers. Street Platoon was called on to stage. Crow and Cynic emerged from the crowd and the crowd�s energy followed them and flowed through them like spirits. Their music created a mob mentality through out the crowd. 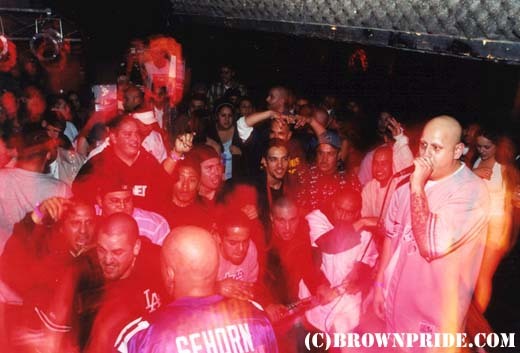 Then special guest Jacken of The Psycho Realm jump on stage to take the crowd to another dimension. Once they started performing �Dead Lines� and �Psycho City Blocks� the crowd was in a mad frenzy creating one of sickest slam pits on the Sunset Strip. Just when you thought the crowd couldn�t take anymore Aztlan Underground took over the stage and continue were the sick-siders left off. Yaolt and Bulldog of AUG started spitting their lyrics and crowd recited them back. When they would finish their verse the crowd would shout out the hooks � We Didn�t Cross the Border, the Border Cross Us!� The interaction between the crowd and Aztlan Underground, it was like they were both feeding off each other. The result the largest mosh pit of the night. I just saw bodies flying everywhere and they loved it! The final act of the night was El Nuevo Xol. Who closed off the night with some hip-hop mixed in with reggae and soul. Their reggae melody�s had all the females grooving to their music. Their rapid-fire Bilingual rapping/rhyming to a hypnotic layback reggae beat is El Nuevo Xol�s trademark style. After the show finished and the crowd started to disperse. The energy of the night invigorated my soul. It felt good to be in the same room with like-minded souls. Events like this one are dedicated to the musicians, artists, activist, poets, and anybody else who is in love with the struggle, representing all under dogs worldwide. When the pressures of the world are on your shoulders and you need an escape. Come join the Revolution, underground style! !